One of the lessons to be drawn from recent events is that fiscal policy is far more potent than monetary policy. 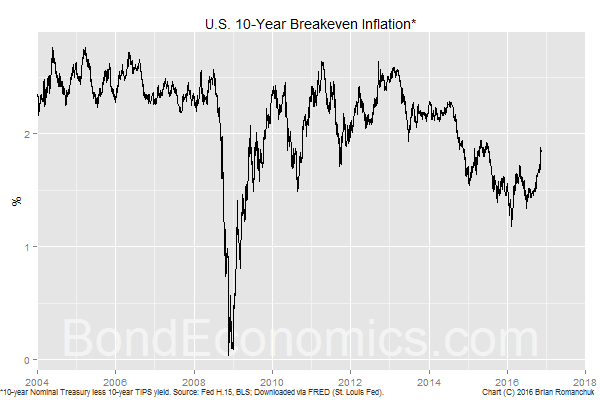 The mere threat of a looser fiscal policy in the United States has driven up inflation expectations (as measured by the 10-year TIPS inflation breakeven rate -- link to primer). This is contrast to the complete inability of Federal Reserve jawboning -- or "unconventional monetary policy" -- to convince market participants that it would push the average inflation rate to near target. My view was that the only thing that could break Treasury yields out of the low interest rate trap was a political change. Although this might be possible as the result of the Trump presidency, I have some doubts. I am not going to claim that I have a good handle of the political forces in play in Washington, but my guess is that policy changes will still tend to be incremental. The Republican Congress will choke on extremely large deficits, and deficits caused by tax cuts (which appears to be the path of least political resistance) are less stimulative than targeted spending. On the economics-watching front, it will be entertaining watching Democratic-leaning mainstream economists walk back their support for stimulative fiscal policy. My guess is that "secular stagnation" will drop off the radar screen once the Republicans have managed to raise the risk free interest rate (that was allegedly permanently lower).